Thinking about a greenhouse kit? Click here for a current Google search on greenhouse plans! 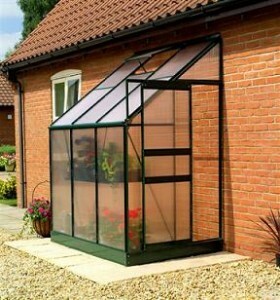 A greenhouse kit offers a finished, workable design. It is also easier for anyone who lacks building experience. Still, it helps to have a bit of do-it-yourself in your blood or be ready to con a friend or pay a contractor into helping. Setting up most any kit has its built-in frustrations. I have yet to see a kit that doesn’t frazzle the best of carpenters a bit. Still, most companies offer good technical assistance to help you through the difficult parts of the process. Some also include helpful videos. With the exception of the portable tent-like greenhouses- plan on it taking as long to set up a level and square foundation for the greenhouse structure as it does to set up the kit greenhouse itself. This is even true if you are setting your greenhouse on wood timbers. Having a quality frame and door are also important. 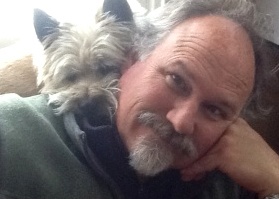 This is hard to determine from photos. If you are considering the purchase of a particular kit, ask the seller if you can find a similar kit already set up in your vicinity that you could visit. If this is not possible check if they have references whom you could call about the kit. You will find that the manufacturers offer many different size options and will often allow you to order custom sizes. What size should you order? It is rare that a greenhouse gardener doesn’t eventually wish for more space. Purchase the largest greenhouse you can afford and/or have space for. Most kits are constructed with either wood or aluminum frames. Wood has an inherent appeal but often requires some basic regular maintenance. 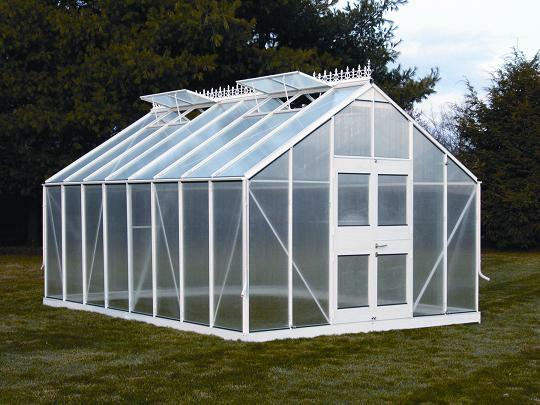 Aluminum greenhouses can be either fragile or sturdy, depending upon the model. Aluminum lasts virtually forever, but is a great conductor of cold outside temperatures into the greenhouse space, unless an effort has been made by the manufacturer to create “thermal breaks” in the structure. A thermal break is where the outside metal is not directly connected to the inner metal structure keeping the inside a bit warmer. Speaking of warmth, many people wonder if their kit greenhouse is solar heated. I have yet to see one marketed as such. You can, however, retrofit the kit greenhouse to be more energy efficient even to the point it maintaining a temperature above 32 degrees F. without a heater! A good solar design requires that you insulate the north wall, insulate the foundation with Styrofoam at least a foot deep; using double or triple thick insulated glazing; sealing every nook and cranny to prevent air leaks; make sure the vents and doors are weather-stripped and caulked; add some thermal storage such as drums filled with water; have a proper orientation with the glazing facing south; and possibly even installing a night curtain for extremely cold climates. 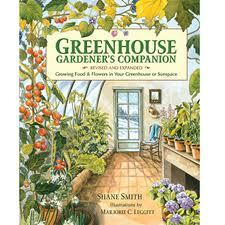 See the discussion in chapter one of my book Greenhouse Gardener’s Companion, titled the “Solar heating greenhouse checklist” for further details on these retrofits. Also see the page on energy conservation for greenhouses. Personally, I think that you can come up with a better, more energy efficient (solar) greenhouse if you are willing to build it yourself. Read the first few chapters of my book before you begin. 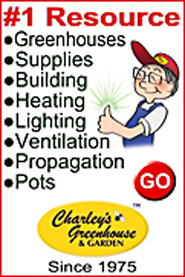 Then visit greenhouse supply companies like Sundance Supply or Charley’s for a great site for do-it-yourselfers. There you’ll find plans and calculators. All you really need to buy is the glazing material, everything else you can find at your local lumber yard! In the end, it is much more of a greenhouse that you really want and if you do it right, will consume less energy! Some kits are designed for attaching to a structure such as a house or garage. If you can attach it to the south side of a structure you can take full advantage of possible solar heating of both the greenhouse and the attached structure. Also, having a greenhouse attached or even close to your home insures you’ll enjoy and take better care of the greenhouse than if it is way out in the yard. Still, having a greenhouse out in the yard is better than not having a greenhouse at all. If you must locate your greenhouse out in the yard try to get it close to a door for better access. Finally, always check into the integrity of the company from which you are thinking about purchasing the kit. You can find many companies that sell kits listed on our kit suppliers page. How many kits have they sold? What is their warranty (on both glazing and frame)? Do they make the kit themselves – or are they simply a retail outlet for kits? If they don’t manufacturer the kit you are interested in, who did manufacture it, where was it made and can you contact the manufacturer directly? Does the company have a toll free number? What technical help do they provide? Do they provide free technical help on weekends when you are liable to run into trouble setting it up? Ask if you can look at the manual to see if it is written in a simple manner? Does the kit require any special tools? Can you get a custom size? How is the greenhouse shipped and packaged? What will they do if the kit arrives damaged? Do they provide any other free options? Many companies offer free growing books, thermometers, potting benches, fans, or other goodies as enticements to purchase their kit- Sometimes you have to ask in order to receive this stuff! A greenhouse can be a big investment. You should feel comfortable with the company you choose to go with so don’t be afraid to ask questions! O.K. It is your turn: If you have purchased a kit and want to comment on it I will post that comment here!